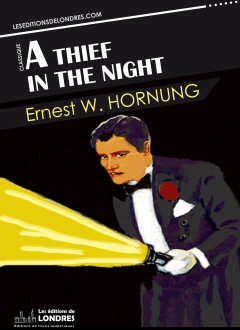 “A thief in the night” is a collection of short stories published in 1905 by E.W. Hornung and features the gentleman thief Arthur J. Raffles and his sidekick Harry “Bunny” Manders. Raffles was one of the first literary signs of revolt against Victorian times. For the first time, a criminal is made into a hero, symbolizing a break from the old order. Raffles has inspired numerous 20th century authors. Graham Greene wrote a play called “The return of A.J. Raffles”. George Orwell wrote an essay called “Raffles and Miss Blandish”. Raffles as an antihero is said to have inspired numerous characters such as the Saint or James Bond. Raffles is born in 1898 and ends in 1909. But in 1905, Maurice Leblanc creates Arsène Lupin, the gentleman-cambrioleur, who will become one of the most famous literary characters in France. Leblanc cannot not have known of Raffles, and so was likely inspired by him, although Lupin is a far more multidimensional character, and does not have a sidekick, as French heroes rarely do.